Accidental Conservationists Jason and Monica, still walking on air after getting a $100 rebate from the Central Utah Water Conservancy District for their new EPA WaterSense labeled sprinkler controller, quickly came back down to earth when it came time to install it. “After 20 years in the water business, you’d think I’d figure it out. But I apparently checked in my water-brain at work,” said Monica. Catch Jason and Monica’s installation efforts here! 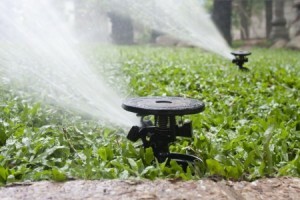 But what they found out about coordinating your existing sprinkler system to the new technology, an effort that added another $300 to the cost of their update, can save you grief in the long run. For starters, realize that just because it works doesn’t mean it’s efficient. If you notice the sprinklers leaving portions of your lawn dry, for example, you might have to tweak your system. That’s the time to make friends with the lawn department at your local home improvement store. Jason and Monica realized their system’s water pressure was so high—almost double what’s recommended for the controller—that it came out of the pop-up sprayer as a mist. A simple pressure gauge that screws directly on the sprinkler spigot sells for about $5 and will quickly give you the numbers you need. Once that’s squared away, you’ll want to come up with a Google Maps image of your home. That allows you to properly zone the pop-up spigots. “You don’t want to water the concrete and leave the flower beds dry,” Monica said. Only controllers with the EPA WaterSense label are eligible. Check out this list of brand and model options and see which one works best with your sprinkler system. To qualify for a rebate, you must live in Duchesne, Juab, Salt Lake, Sanpete, Uintah, Utah and Wasatch counties or in the Francis and Woodland areas of Summit County. You must turn in your rebate request within 90 days of purchase along with a valid sales receipt or invoice, a picture of the installed controller and a picture of the weather station/sensor if the controller has one. All requests must be received by Jan. 31, 2017. For more information on the CUWCD rebate program for residential use, visit our website.